This collection of headstone and memorial photos is intended mostly to cover cemeteries for which there is no on-line lists of names. We hope that the photos of the headstones will help to provide a sense of place for those who can't visit the cemeteries personally. We are based in Brisbane (Queensland, Australia), and mostly that determines where we visit. We try to photograph all the memorials at a site, however if they are locked away out of sight, then we don't photograph them. The transcriptions of the memorial inscriptions is generally limited to the genealogical information. If you are aware of any such omissions, please contact us, and we will correct the completeness statement until we can re-visit. We can also add contact details to photos. Please note that the "photos" page will include thumbnails of all the photos, so may be slow to load. The number of photos is given in parenthesis. There is an FAQ . This isn't the much larger city council Bulimba/Balmoral cemetery. For this please see the BCC. Capella (old/memorial), Central Highlands. names (32) in alphabetical order as at Aug 2016. Capella (Peak Downs), Central Highlands photos(315) and names in cemetery and alphabetical order - as at Aug 2016. (Also known as the Indooroopilly Cemetery). God's Acre, Archerfield, Brisbane photos (87) and names in cemetery and alphabetical order - as at April 2005 (and other references). Kalbar (Engelsburg) Baptist cemetery, Boonah Shire photos (106) and names in cemetery and alphabetical order - as at Nov 2005. Also burial register. Ma Ma Creek St Stephen's Anglican cemetery, Gatton Shire photos (582) and names in cemetery and alphabetical order - as at April 2006. Marburg Trinity Lutheran cemetery, Ipswich photos (423) and names in cemetery and alphabetical order. Memorials are from old Paddington cemetery, also known as Brisbane General and perhaps Milton. For more information on this church, visit their WWW site. Minden - Wenck burying ground/Coolana private cemetery, Esk Shire photos (5) with names by photo and alphabetical order, and burial register. Photos from 1993. Balmoral (also known as Bulimba, Morningside and Kangaroo Point) cemetery, Brisbane photos (2) and some names in cemetery and alphabetical order. Bourke NSW photos (11) and certain names . Brisbane general cemetery (Toowong) cemetery, Brisbane (0.01% coverage, 11 photos of the 119000 graves) for certain names cemetery and alphabetical order. (Old old) Brisbane general (North Quay) location and some history. Early Brisbane Childrens burial site on North Quay(North Quay) location and some history. Crows Nest cemetery, Crows Nest Shire photos (1) and names in cemetery order. Old Dubbo (NSW) cemetery photos (3) and names. Drayton and Toowoomba cemetery photos (31) and some names in cemetery and alphabetical order. Eucla Telegraph Station (WA) photos of relocated headstones and names. Fremantle (WA) (1) with name. Goodna general cemetery, Ipswich photos (196) for certain names in cemetery and alphabetical order. (Older graves pre-1950 comprising approximately 25% of the visible headstones). Grytviken cemetery, South Georgia Island photos (8) and names in random and alphabetical order. (Incomplete from 1996). Lutwyche cemetery, Brisbane photos (2) and certain names and alphabetical order index. Mt Thompson Crematorium, Brisbane photos (1) and certain names and alphabetical order. Nyngan, NSW photos (30) and certain names and alphabetical order. Nundah cemetery, Brisbane photos (35) for certain names in cemetery and alphabetical order. Penrith St Stephen the Martyr Anglican Church cemetery, NSW photos (15) for certain names in cemetery and alphabetical order. Penneshaw cemetery, Kangaroo Island, South Australia. photos (10) for certain names in cemetery and alphabetical order. Sofala (Old) photos (1) and certain names . Also Sofala new and Sofala Anglican (with a name). South Brisbane (Dutton Park) cemetery, Brisbane photos (11) and names in cemetery and alphabetical order. 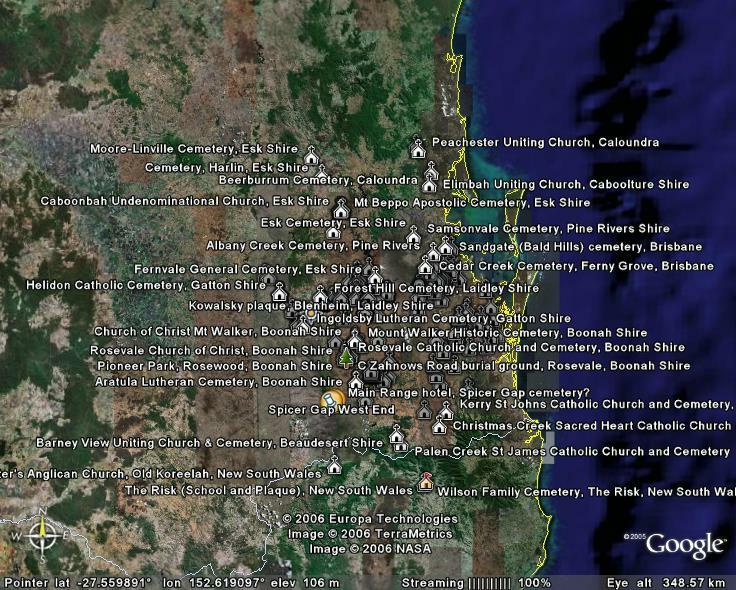 Locations of Brisbane / South East Queensland cemeteries in photo collection , and the summary page of all cemeteries. To report errors etc, contact us.